New Grizzly 300 offers 720 pounds of towing and 140 pounds of load capacity on front and rear racks. Farmers and ranchers who want a utility ATV for work and play have a new choice in Yamaha's new Grizzly 300, a 2WD model that can pull 720 pounds with a shaft drive line, an automated dual-range transmission and roughly 6 inches of suspension travel. In addition to its towing capacity, the 300 can carry 140 pounds of combined load on its front and rear racks. The all new entry into the Grizzly lineup comes in Hunter Green and Steel Blue, and is powered with a liquid-cooled 287 cc single overhead cam engine that breaths through a 32 mm carburetor. The 300 features separate hydraulic front and rear disc brakes, and rolls on Maxxis tires with a rugged lug pattern for traction and durability. 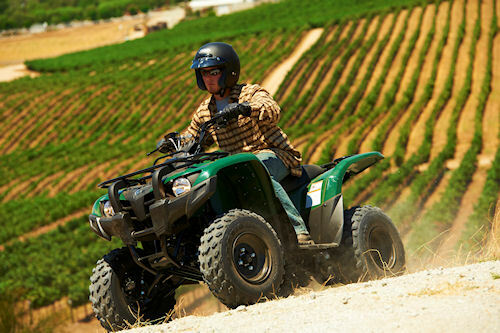 The new Yamaha Grizzly 300 offers a durable, dependable ride for work or play in a two-wheel-drive format, powered by a class-exclusive liquid-cooled engine. Operator convenience includes a plush seat, push-button electric start, a water resistant seat storage box and large front and rear fenders and full floorboards. Under the seat, marine-grade electrical components ward off the elements just behind the 2.8 gallon fuel tank. 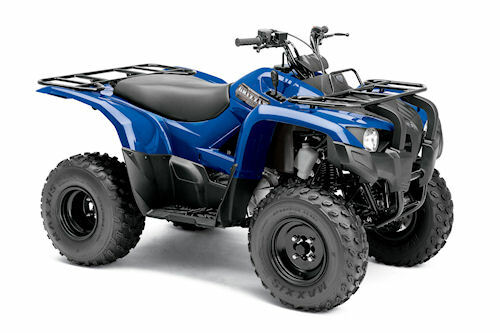 For more information visit www.yamaha-motor.com. At under $4,100 the Grizzly 300 is the only model in its class with a fully automatic dual-range transmission. The 300 is powered with a 287 cc single overhead cam four-stroke engine.